This Beautiful FRESHWATER Cobalt 46 Express is Powered by Twin Cummins QSC8.3 HO 600 HP V Drive Diesel Engines with only 275 hours on them. With gorgeous lines coupled with the high quality and attention to detail that has made Cobalt famous. 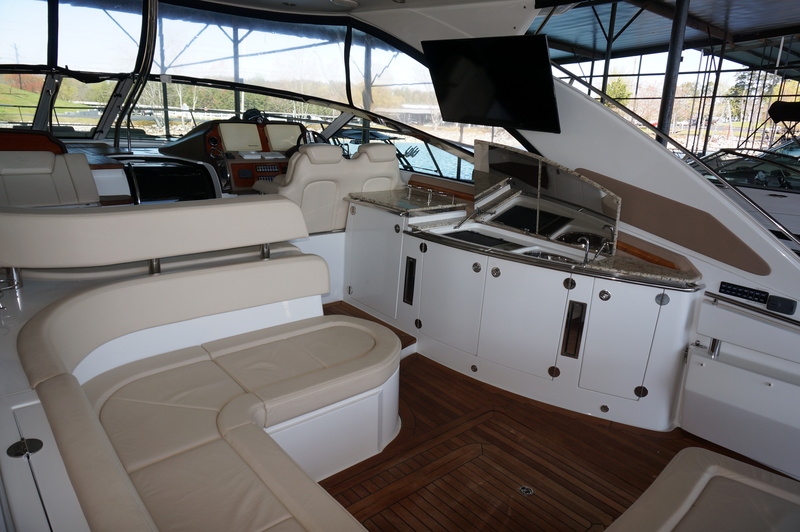 Boarding is from the stern which features and oversized fiberglass and teak hydraulic swim platform. 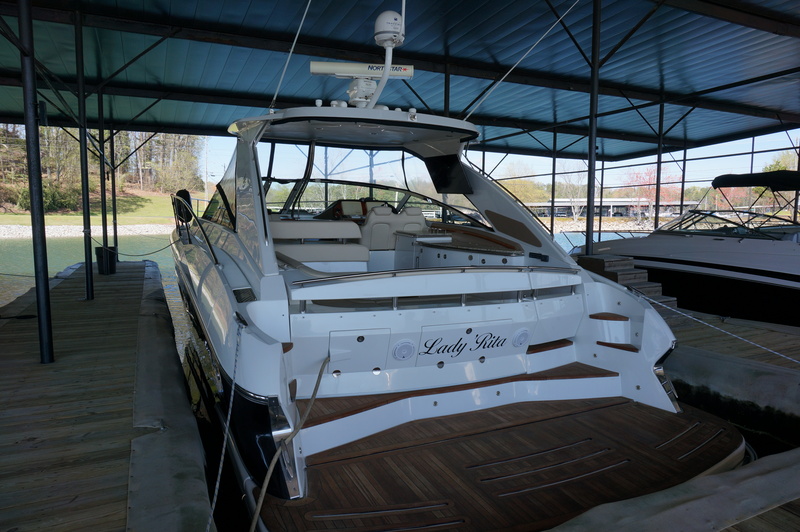 The design is unique in how it flows into the overall lines of the boat rather than looking like a protrusion, which you see on so many other express cruisers. The swim platform makes launching of a tender very easy. 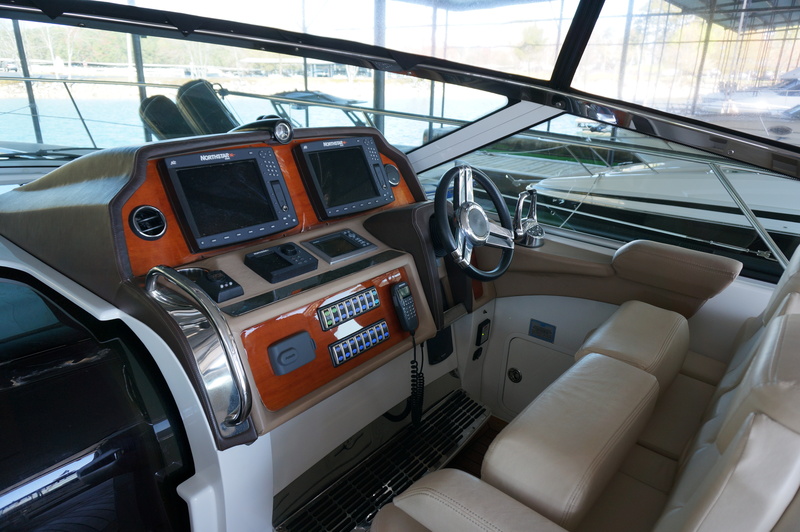 Entering the cockpit from the swim platform you will instantly notice the quality of the materials used ranging from real teak decking, rich cream colored upholstery, oversized polished stainless steel and real granite countertops. 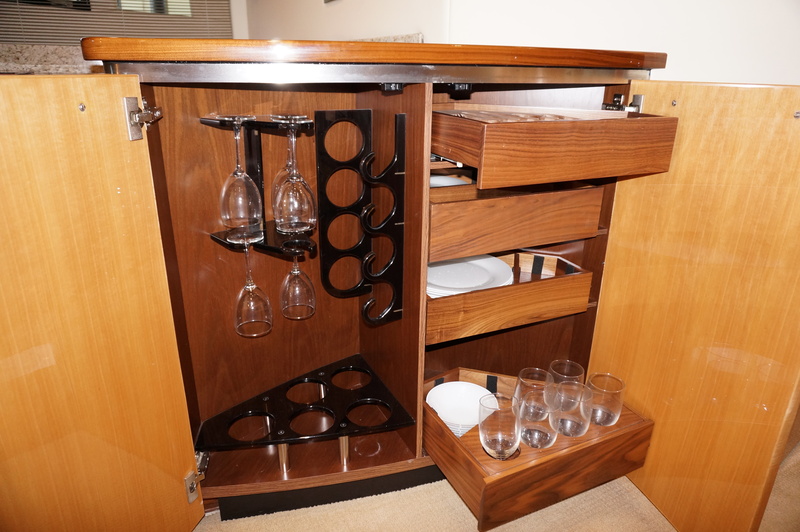 A large wrap around lounge is to port and features a clever fold away teak table that is perfect for al fresco dining or cocktails. Across to starboard is a wonderful entertaining area / wet bar which features a cockpit sink, built in trash receptacle, stainless steel refrigerator, built in electric grill, and storage cabinet. The grill and sink are recessed under granite counter hatches that lift up and have polished metal splash guards on their underside. The entire cockpit is air conditioned and heated and air is supplied through polished stainless steel vents. 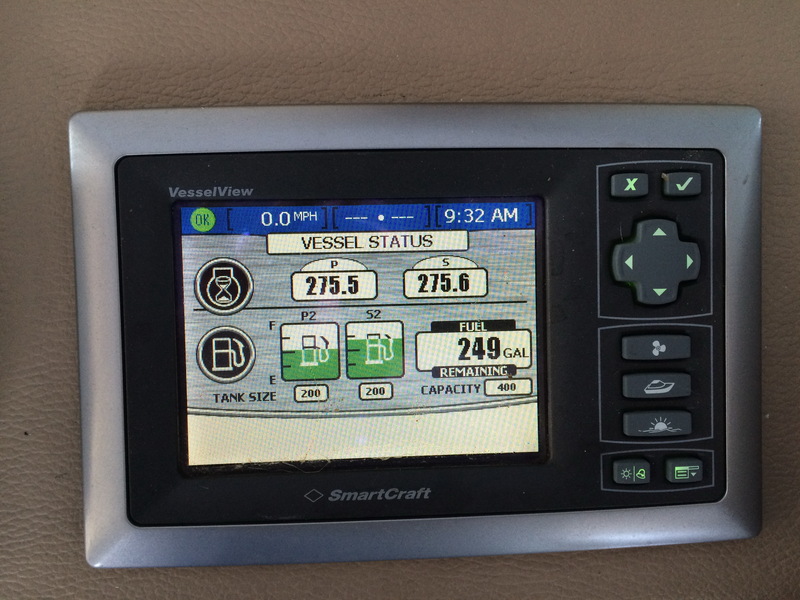 The helm is forward to starboard and features a double helmsman seat, full featured helm and rich wood grain dash. There is a wide L- shaped companion lounge to port that is raised for great visibility and relaxation. Access to the bow sun area and for line handling is through a windshield opening making it safe and easy to go forward rather than walking around on side decks. The cockpit has a stylish hardtop with tri-color LED lighting and does have a full enclosure. Going into the cabin, it is very apparent that Cobalt was determined to use only the finest quality finishes throughout. Real leather, real granite, real glass tile, etc. 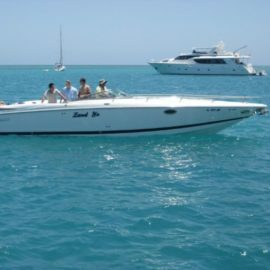 were used throughout eliminating the “faux” adjective used in so many boats of this size. To starboard is a u-shaped lounge with high gloss inlaid wood table. 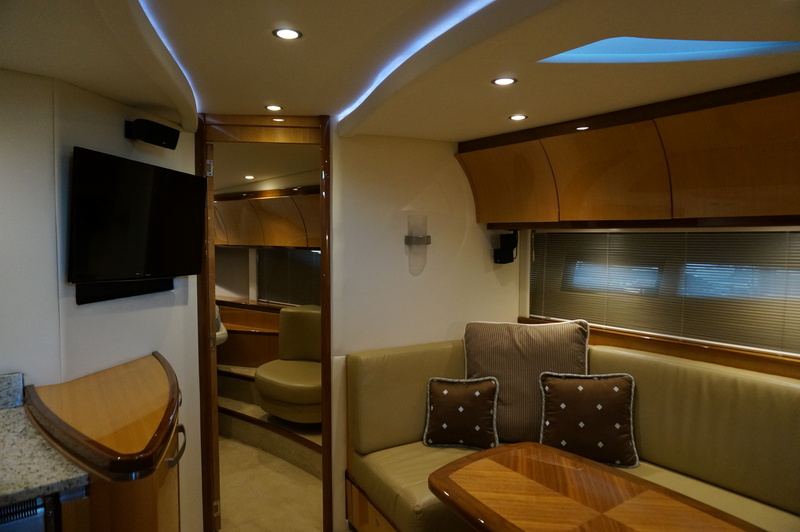 Beautiful high gloss bow front cabinetry abounds and the area is flooded with natural light from unique side windows and ports and led lights overhead. 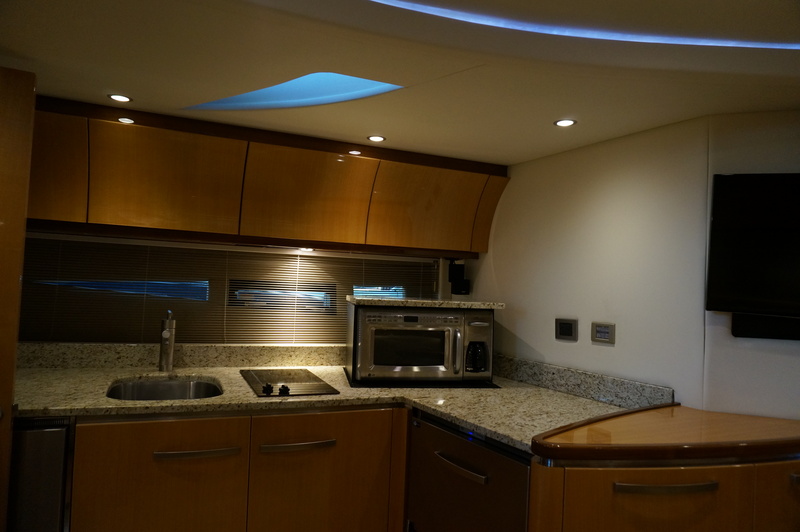 The galley is to port and is a true standout done in beautiful light colored granite and stainless steel appliances. A unique feature in the galley as is that at a touch of a button, a microwave oven and coffee maker lift up out of the granite counter where they are concealed when not in use! 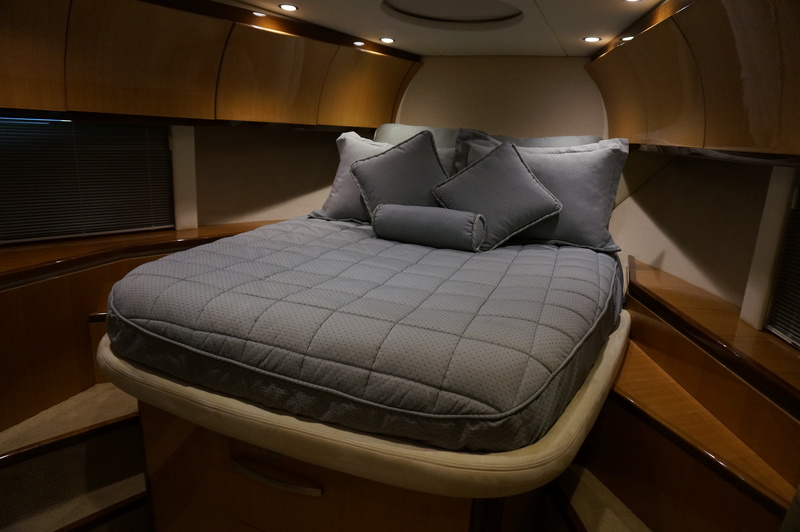 Forward of the salon is the master stateroom which has an island queen center line berth, hanging locker and drawer space, as well as a leather seat. The master head is to port and is a piece of art in its own right. Walking in there is a granite vanity counter with frosted glass vessel sink perched on a high gloss wood cabinet. Glass tile is used on the floor and above is a rain shower head. Cobalt ingeniously used a fold out panel system that takes the full length mirror wall and clear panels to form a stall shower directly over the tile floor with the rain head above. 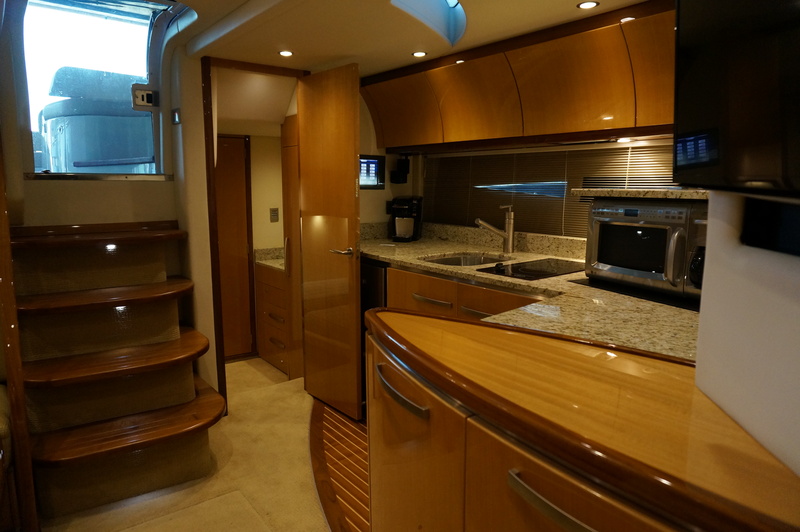 A stunning bathroom that has no comparable in this class of boat! 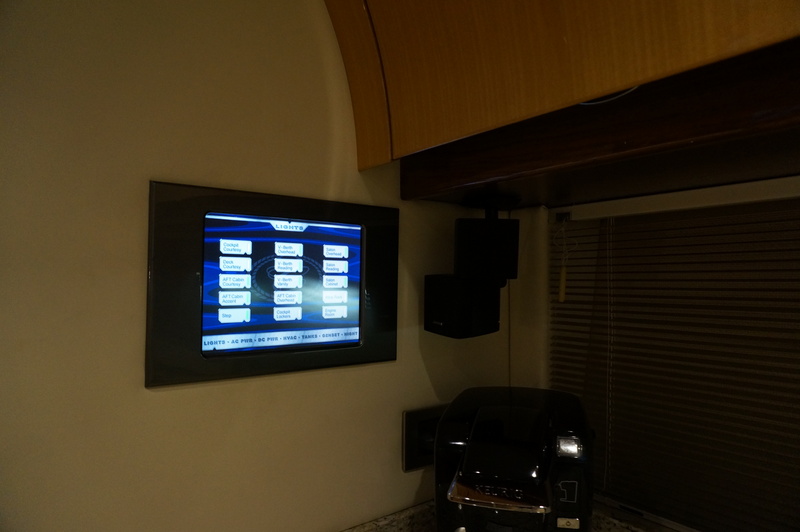 The guest stateroom is mid-ship and is privately entered through a high gloss wood door aft of the salon. This very comfortable stateroom features two twin beads that can be made into a large queen berth as well. Guests are spoiled by their own head that again features rich granite counter tops with a frosted glass vessel sink. 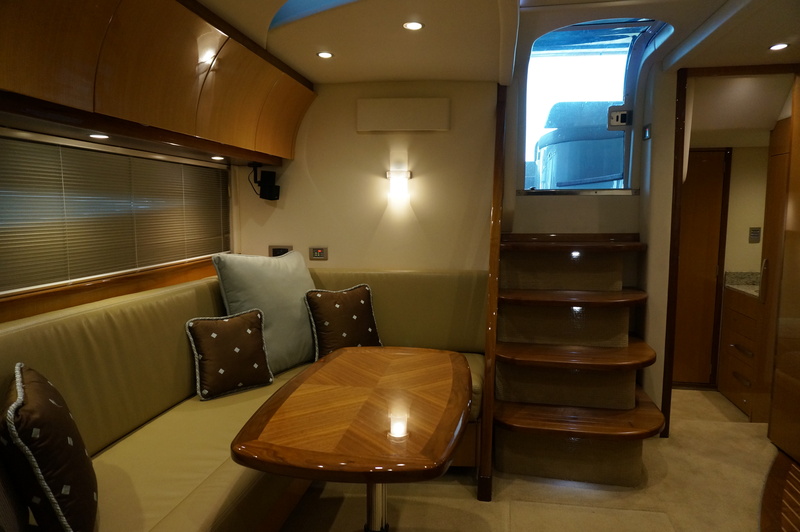 A separate stall shower rounds out this head area and the boat’s layout makes trips with another couple or family and friends very comfortable with the sleeping and head areas being very private.